It was, roughly speaking, in the mid 1990s that someone, most likely in the US, thought to put together the words ‘green’ and ‘infrastructure’. Roll on to 2013 and the concept of green infrastructure is still a relatively unfamiliar concept outside the green sector, but it is one that is increasingly set to take centre stage. Though exact definitions of green infrastructure may vary, the consensus is that its key purpose is to produce cleaner air. And that’s a matter that concerns every one of us. I had the opportunity to speak on the issues, practical challenges and solutions involved with greening our urban environments at this year’s Greenbuild Expo. The challenge is stark. World-wide, more and more people are living in urban environments with limited access to green space, while – at the same time – in many parts of the world pollution levels are increasing. In Europealone, a 10% increase in urbanisation is expected between 2000 and 2015, while 45 million people already have limited access to green space. There is a huge body of research that links poor air quality to higher asthma rates, lung problems and even stunted lung growth in children. There’s also a growing body of research evidence to link greenery in the form of trees, plants and other vegetation to a happier, healthier urban living experience. Among their many virtues, plants breathe out oxygen and remove pollutant matter or dust – called PM10s – from the air. In addition, greenery also encourages bio-diversity in cities, offers shade, promotes a feeling of wellbeing and can even help reduce crime levels. At Mobilane, we are working in partnership with Staffordshire University to explore more fully the range of benefits offered by green infrastructure. It was my pleasure to present at Greenbuild alongside John Dover, Professor of Ecology at the university, who talked about the meaning of green infrastructure and the potential for integrating greenery into urban areas. A creative approach will certainly be needed to ramp up the green volume in our cities. Trees take up huge amounts of space and require relatively high levels of maintenance. Our living screens and Living Walls offer a vertical way to green up space that produces immediate results both in terms of aesthetics and PM10 reduction. We also have a range of temporary green screens such as Living Hoardings that can boost greenery levels around construction sites – and help offset building projects’ carbon footprint. If green, living structures are to become an integrated feature of urban landscapes, our notion of how greenery is used will need to become far broader. But the results will be well worth it – cleaner air for everyone. 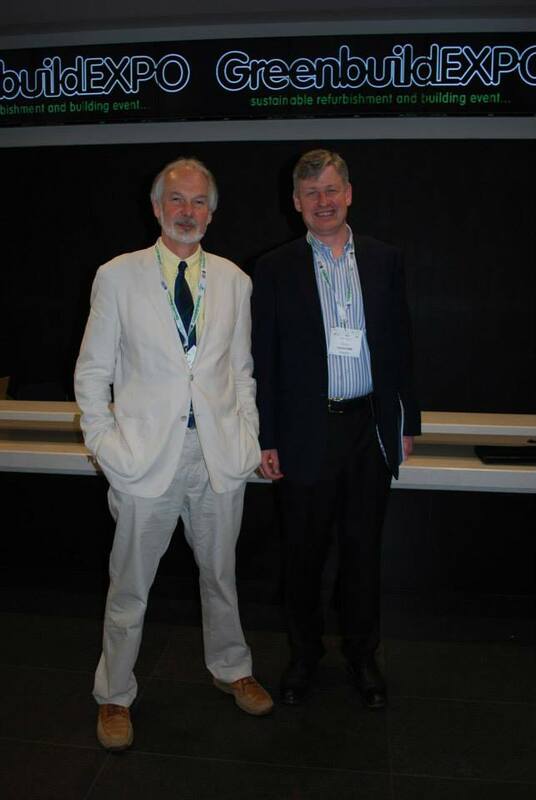 Professor John Dover of Staffordshire University and me at the Greenbuild Expo in Manchester. Adding foliage to buildings is not a new concept. The greek historian Dionorus recorded a technically detailed description of the Hanging Gardens of Babylon which described how the garden was built on tiers with vaults which carried the weight of planting; he even described the waterproofing system used for a green roof substantial enough to support trees. However, in recent years, the concept of greening buildings has enjoyed a renaissance as society looks to develop a cleaner, more pleasant and sustainable way of living. Living walls deliver a range of benefits beyond the obvious and stunning aesthetic. Some benefits are obvious and need little explanation, such as the ability of foliage to remove carbon dioxide from the air and to exhale oxygen via photosynthesis. However, foliage also improves air quality by removing particulates, and unlike trees, foliage on walls does not impact drastically on footprint or restrict air flow and helps to reduce ambient temperature in the urban environment. Few external cladding systems can match the ability of living walls to fundamentally change a building’s appearance. Traditional mechanical cladding systems, such as metal, glass and bricks, are supplied in an endless range of colours and finishes to offer the designer a broad palette with which to be creative. However, a living system changes a building exterior from something which is inanimate to something which lives and breathes, changing with the seasons, constantly growing and even moving with the weather. Apart from the aesthetic and environmental benefits, living walls and Green Screens also offer a surprising range of uses in the private, public and commercial spheres. Schools and other public buildings are increasingly using living systems, while many local housing authorities are realising the benefits of easy-to-install, sustainable Green Screen boundary systems which are delivered pre-grown and which adhere to boundary Building Regulations. Living walls and Green Screens are also being used by local authorities as a deterrent against anti-social behaviour such as graffiti and Green Screens are also being installed alongside highways to improve road safety. However, the market for living walls has, in recent years, been somewhat tarnished by doubts about the reliability of systems following to the failure of a few high profile examples. But the logic behind criticism of the concept of living walls is flawed. It is akin to claiming that cars are not a good idea because Toyota made some mistakes in 2009. It fails to take into account the development of successful modern systems which are tried and tested and which are extremely efficient. Perhaps the best example of a European living wall exists in Monaco; a surprisingly harsh location for living walls as Monaco is water-impoverished and with a hot, sunny, marine environment. Yet the WallPlanter living wall in Monaco’s Avenue Princesse Grace has thrived since it was first installed in 2006. The south faced wall fronts on to the sea and is bathed in strong sunlight throughout most of the year with temperatures reaching an average high of 80o F in August, and an average low of 43o F in winter. Precipitation averages 31.7mm a year, which contrasts dramatically with 611mm in London. In London a fine example of a living wall can be found at the O2. The site owner had a need for a barrier to shield visitors from construction work on a nearby housing development. Mobilane supplied a simple living wall system which was installed on an open steel structure. The 150m long, 8m high wall took just over a week to install and requires minimal maintenance. Four years after installation the wall remains impressively verdant. These and other successful living walls go largely unnoticed, which is to be expected. ‘Living wall continues to thrive’ is nowhere near as good a headline as ‘Living wall fails’. The secret for designers thinking of specifying a living wall is to speak to the supplier and to ask to see examples of previous systems. This is, unfortunately, a relatively standards free marketplace, so designers need to do a little extra work to check that suppliers can deliver on reliability and post-installation maintenance. All living systems need maintenance, from the humble office spider plant which needs to be periodically watered and fed, to full blown living wall systems. But the latest state-of-the-art living wall systems feature automated monitoring watering and feeding systems and require minimal inspection and maintenance. The latest development in living walls sees them moving indoors. The new LivePanel Interior wall system (a development of the successful exterior system) is suitable for a wide range of building types, including offices, call centres, hotels, leisure centres, retail and business centres. The system is easy to install and requires no building alteration work prior to installation. All that’s needed is a plain wall, suitable lighting and an electric power socket. A basic system can be installed in a single morning. The benefits of plants in offices and other public spaces are widely recognised. Surprisingly, the air inside a building can be up to nine times more polluted than outside due to emissions from electrical equipment, paint, and furniture, which can be compounded by inadequate air conditioning and ventilation. Plants combat this by removing carbon dioxide (which lowers work performance), as well as particulate pollutants and volatile organic compounds (VOCs) and help to balancing humidity. The psychological effects of plants indoors are also well understood and research has shown that interior plants can reduce stress, improve health, affect mood and increase productivity in the workplace. The LivePanel interior system features a built-in computerised irrigation system and specially developed nutritionally balanced minerals substrate to support vegetation. The system can support a wide variety of plant types, depending on available lighting and level of maintenance needed. Maintenance is minimal and once a month the system is serviced and the water and feeding levels are tested. The reservoir will be adjusted accordingly if required. The system takes up little space, but the effect is stunning. We will increasingly see more living walls in the urban environment, both indoors and out, just as we have seen a dramatic increase in the number of living roofs. There is some work to be done to combat cynicism, but the future is definitely greener, in the most literal sense of the word.